0 Comments Published by KL Ocs Kid on Monday, August 27, 2007 at 12:08 AM. 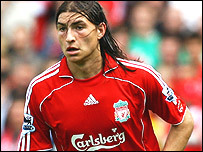 Liverpool have sold young Argentine centre-half Gabriel Paletta to Boca Juniors for an undisclosed fee. The 21-year-old arrived at Anfield in the summer of 2006 after impressing at the 2005 World Youth Championships, which Argentina went on to win. He made his debut in a 4-3 League Cup win over Reading at Anfield in 2006, scoring in the second half, and went on to make eight appearances for the club. However, with opportunities limited, Liverpool have agreed to sell him. Paletta played in all seven of Argentina's successful campaign in the 2005 World Youth Championships, alongside the likes of Lionel Messi.